Thirty days after submitting the manuscript to Depot, the books, music, and gifts division of Pantaloon Retail India Ltd, he has a book he could hold. The work, titled People Super Highway, was Depot’s first self-published book. “Here (at Depot) they said we only make as many books (copies) as you order," Anand says. “They are in your control and it’s your property… You get your royalties as you print and sell." 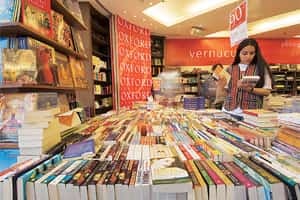 Pen it down: A photograph showing the inside view of an Oxford Bookstore in New Delhi. Self-publishing is helping authors publish their work at a fraction of what would cost to go to traditional publisher. Anand, 65, hopes bookstores in the US, such as Barnes and Noble Inc., will sell his book. Self-publishing is widely prevalent in the US and Europe. In a tradition that has been around for decades, printers and book sellers in India — both retail stores and distributors — have been printing limited runs of books for authors without publishers. Indeed, while there are several self-publishers and small presses across India, such as Little Fairies and Power-Publishers, Depot says it is the first to put such books in its stores. The process is simple at Depot. Any writer who has a manuscript and wants to have it published, logs on to the company’s website, picks the size and cover of the book and chooses from services such as layout, design and proofreading. The book is then produced and stocked on the shelves of the 110 or so Depot stores. “I think this trend is going to explode," says Preeti Vyas, business head of Depot. “Self-expression is every human being’s right. So, many people are sitting on manuscripts without any outlet for it." A minimum of 25 copies are required for availing Depot’s service. An average-sized novel would cost about Rs15,000 for 100 copies, says Vyas. The company says it has about 40 books in the pipeline, including a cookbook by a housewife in Pune and a novel, Zombie the Scientist, by an 11-year-old in Mumbai. According to Pinaki Ghosh, chief executive of Kolkata’s Power-Publishers, there are about 20 self-publishers in India. The number, he said, is expected to increase. Power-Publishers, started in January 2008, has self-published five books and will publish another 30 by October, he said. The company charges a 30% commission for each book sold on its website. Ghosh said the number of clients coming from the US, Australia and Europe is on the rise. He said outsourcing self-publishing to India costs about one-third of that abroad. “Our goal is to provide self-publishing service at rock-bottom prices, mainly for buyers of USA, Europe and Australia by offshoring and outsourcing the printing work to India. We get 80% of the work from these countries," he says. Still, some traditional publishers say very few strike it rich through self-publishing. Also, high-quality editorial and marketing services are often non-existent in such efforts. “When you’re looking at the difference between self-published books and publishers, the difference is in the guarantee," says Nilanjana S. Roy, chief editor of publishing firm Westland Ltd. “A mainstream publisher offers a certain range of services, which are implicit to an author. It’s kind of understood that a book coming from any mainstream publisher will have been discussed before it’s taken on and will have been edited… That level of refinement or advice would not be available for a self-published book." The marketing spend is also much higher with traditional publishers, as they have greater incentive to see the book sell. A low-end launch would cost at least Rs60,000 and that includes just tea and biscuits. An average launch costs about Rs1-2 lakh, says Roy. She adds that when self-published books are sent to her, she tends not to read them because the quality is often low. While some famed self-published authors, such as Rudyard Kipling and Virginia Woolf have done quite well, Roy is yet to find such gems. Pankaj P. Singh, owner of The Browser bookstore in Chandigarh, says that of the 60,000 books in his store, less than 1% is self-published. “They are mostly on topics that are not mainstream but personal experiences that people want to share with others, like spirituality, poetry or well-being," Singh says. In the past, an author would have to publish thousands of copies, he said. Now they can order one or two copies without depending on a publisher. With the increase in self-published books, he is wary of poorer quality material. “When you take from good publishers, you know the content is rated. In this case, you have to be very careful or you’ll have books that won’t sell." Depot says authors using its services retain copyright. Vyas points to a simple statistic: over 98% of all unsolicited manuscripts submitted to traditional publishers are ignored or rejected. Self-publishing is a guarantee at least to see your name in print, says Vyas.